New Year Mingle - Let's Discover Gourmet! Let's Celebrate Protected content ! Let's kick-start the New Year by meeting new people and making new friends! Join us for our New Year Mingle for a fabulous evening of socializing with like minded ladies & gentlemen and making new friends in a comfortable and fun environment. This social is for ladies and gentlemen of all age groups! Your host will warmly welcome you to the group and also help you with introductions! 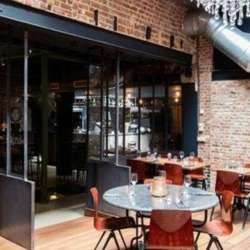 Our Venue: Located in the Ixelles neighbourhood of Brussels, The Restaurant and Bar Protected content gourmet and bistronomic in Ixelles - Brussels - ranks among the top 10 "places to be" with a special sort of vibe! It's quirky and eclectic while still being comfortable and inviting, which makes it the perfect evening spot! This is a pre-paid event but you have to register at Eventbrite in order to attend. We do this to minimise no shows, manage the gender balance, to know who you are and make venue arrangements properly. We are limiting the total number of guests so please grab your spots now before they run out! So come out, join us and make new friends this New Year! - We have our area booked for InterNations - Brussels Cullinary Delights. Please ask the bar staff for our area and they will help you find us. - I will be hosting this event. You will be warmly welcomed at the venue and I will also introduce you to other attendees, so there's no need to feel nervous! - All guests will get a complimentary welcome drink. The Restaurant has a wide choice of fabulous drinks available for thereafter.